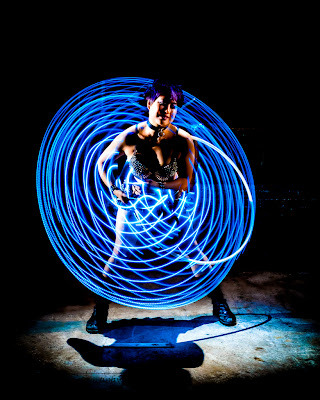 This photo of the talented performer, Memory, working her LED hoop was recently featured on the from page of hooping.org. I used a tripod mounted camera and a 1 or 2 second exposure to capture the light trails from the hoop. This also allowed the hoop glow to color the shadows. Rear-curtain sync brought the three speed lights (top, left and and right) in to freeze the action and give me a sharp Memory in the middle of the light.